Well, didn't that week go by so quickly! 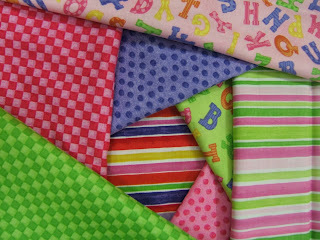 I will tempt you with some pictures of a couple of gorgeous ranges of fabrics that have arrived this past week. 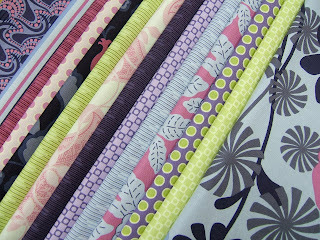 The first is a range called "City Girl" - designed by Kitty Yoshida for Benartex Fabrics. What do you think? Pretty yummy. This is my favourite piece (well, this week, anyway). Last Friday at ''stitching'' the girls happily posed for a blog shot. It is quite simply the best way to end the working week - a few hours of stitching, plenty of chat, coffee and cake. 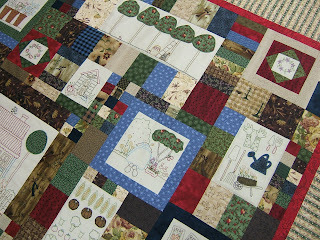 Debbie brought along her finished quilt - The Gardeners Journal - designed by Anni Downs of Hatched and Patched. Thought you might like a peek at it. And a little close up - just so beautifully stitched and wonderful colours. 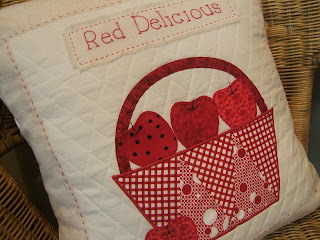 "Red Club'' has been and gone for another month and this is what the girls made - cute little cushion cover - lots of little techniques in this one, foundation piecing being the one that took the prize for ''most thinking required''. 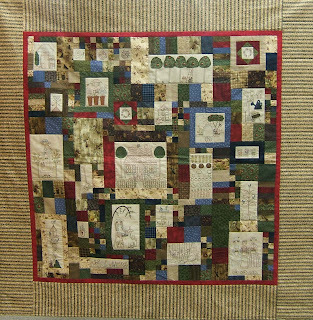 I'm off now to trace some stitcheries for the new block of the month quilt I am starting, designed by Leslie McConnell, or, I might do a little more sewing of the jelly roll quilt sample for the class at the end of the month. Choices, choices! have a great week with lots of stitching. 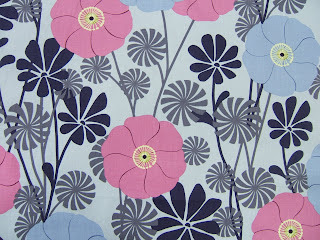 Joyful Jenny - your newsletter, you blog and your store make me wish I lived in Dunedin. I am using the fabric I got from The Stitchery in a free style quilt (no ruler shock horror) of the African-American tradition. Will send you a photo when it is done. Keep writing - you inspire me.